Today Heathcote Botanical Gardens of Fort Pierce Florida was hot. It was my first time back since Tropical Storm Fay hit us. Heathcote was not damaged to much, the grounds keeper J.D. was telling us what happened, there was minor flooding in certain areas, some trees went down but for the most part Fay cleaned up. Today Brandan and I cleaned up some areas that were affected by Fay and we transplanted a Red Feather Palm Tree ( Chambeyronia macrocarpa ) that was originally planted in the sun. These Palm Trees are much more happy in the shade. Some other names for this Palm Tree are Houailou Red Leaf Palm,Blushing Palm Tree and the Flamethrower Palm Tree. This Palm does not get very tall, they grow to heights of about 6 feet. This one wasn't looking at it's best so we thought it would be best to move it. We have documented today's transplant and I will show you step-by-step how we did it. Here is the name tag. Here is a before picture of the Red Feather Palm Tree. As you can see it is directly in the sun. I thought that it gave off a nice shadow. Here is a closer look at the Palm Tree. After we picked out a location to transplant the Palm Tree into, we dug a hole for it. Then we filled the hole with water. This is an important step in transplanting, always fill the hole with water. Then we went over to the Red Feather Palm and dug it out of the ground and transported it over to the water filled hole. After we placed the Palm Tree in the hole, we added more water. Water is your friend when transplanting, use lots of it. This is another view of the watering. While adding water we added dirt back into the hole. When adding dirt back into the hole you capture air bubbles which can cause your roots to dry out and damage your tree or even kill it. To prevent this from happening I use a piece of metal rod and stab it into the ground surrounding the tree. This action releases the air bubbles. Then we finalized the project by mulching. The following is a close up picture of the Red Feather Palm Tree fronds. For today's Tuesday Tip I have chosen to talk about lawn mowing heights. The height of your grass is essential to it's well being. Do you like those lawns with the perfect thick grass with no weeds in sight? I do to, that's why I decided to give you a little tip on how to achieve that perfect grass. Mowing height is probably the most important part of mowing. Most grasses manufacture sugars through the process of photosynthesis so they can collectively develop into a high quality lawn. If you mow your grass at low heights then you leave limited leaf area to sustain the photosynthesis rate that is necessary to maintain good vigor. Basically, a lawn mowed too short will have a shallow root system with little total root mass. This is something I notice a lot of. Mowing height can play an important role in preventing weeds from developing. I have heard that higher mowing heights resulted in less weeds . The reason for this is that higher grass provides more shading and competition to the weed seedlings during germination. When mowing your grass you should adhere to the 1/3" mowing rule. You should not have a time when you mow your lawn, like once a week or twice a week. Your lawn will grow at different rates at different times. The best thing you can do is follow the 1/3" mowing rule. To get your recommended lawn height you need to look up your grass type and recommended growth heights. An example of the 1/3" mowing rule is if your grasses recommended height is normal at 2 inches, the height of your grass should not be allowed to grow beyond 3 inches before it is mowed back down to 2 inches. If 1 inch is mowed off, then 1/3 of the total blade length is removed and the 1/3" mowing rule has been followed properly. With that being said, if you follow the general 1/3" mowing rule, you will have a very nice lawn. Of course regular watering and fertilizer aren't going to hurt either. So remember, break your habit of mowing the same day all the time and start listening to your lawn and only mow when it is necessary. I hope you found this post useful. Se you again next Tuesday! Thank you for joining me again for number 2 of Medicinal Monday's. Today I have chosen the beautiful Passion Flower Vine ( Passiflora incarnata ). The Passion Flower Vine also goes by the names : Maypop, Apricot Vine, Passiflore Rouge, Passionsblume, Purple-Passion Flower, and the Passion Vine. The Passion Flower Vine is native to the Southeastern section of the United States and can be found anywhere from Virginia to Florida and over to Texas. This vine is happy in sandy soil in the full sun and can reach heights of 30 feet. When the fruit of a Passion Vine is ripe it is a yellow-green color and is about the size of a small egg. You can eat the yellow pulp and it tastes sweet. The delicious fruit and flowers may be eaten raw or cooked in jellies, and the leaves are eaten in salads. To some the Passion Vine is an invasive annoyance. They just don't know the power that this vine holds. I will now go over some of the Pros and Cons of the Passion Flower Vine. Recent studies have pointed to the flavonoids in the passion flower vine as being the primary constituents responsible for its relaxing and anti-anxiety effects. Some of the plants constituents, Apigenin, Luteolin, Kaempferol, and Quercetin, are being studied and are showing promise in fighting Parkinson's Disease, Cancer, HIV, and Leukemia. The leaves and stems are medically used as anti-spasmodic, astringent, diaphoretic, hypnotic, narcotic, sedative, vasodilator and are also used in aiding the treatment of women's complaints. The Passion Flower Vine is also used as an alternative medicine in the treatment of insomnia, nervous tension, irritability, neuralgia, irritable bowel syndrome, premenstrual tension and vaginal discharges. An infusion of the plant depresses the motor nerves of the spinal cord, this makes it very valuable in aiding the treatment of back pain. The infusion is also a sedative and slightly reduces blood pressure and increases the respiratory rate. This herb contains alkaloids and flavonoids that are an effective non-addictive sedative that does not cause drowsiness. It is also of great service in epilepsy. Here is an Herbal Tea recipe to help with late night restlessness: take 1 tbsp dried herb and add it to 1 cup boiling water and let imbue for 10 minutes. Drink this aromatic, flavorful medicinal tea just before bedtime and you should sleep like a baby. Looks like the pros out weigh the cons on this one too. To those who think this vine is invasive, do you know what it is? If you grow it in a pot you should be alright. Besides, it seems like a small price for all of the benefits it has. Here are some pictures of my Purple Passion Flower Vine. Did I mention how cool this flower looks. I hope you found this post useful. Feel free to leave your thoughts about this post. Tropical Storm Fay is completely gone now. She did set a record for herself by hitting Florida 4 times before she moved on. The last I heard Fay had taken 11 lives while on her path of destruction. Today here in Fort Pierce Florida we have had full sun so far. The sun is a nice change after a week of gloomy skies and rain. The down fall is that the sun is now drawing all that water up which is creating a very humid environment. It is already very humid here as it is, but now when you are outside it feels like you are in a pool. The air is very moist and thick. It was a perfect beach day. The water was really murky though from being all stirred up during the storm. Today was the first day that I took my son to the beach. He had a great time soaking up the sun, but he got hot so quick he jumped out of his suit right when we got there. The following pictures are of my sons first day at the beach right after Fay has left us. Yeah, I Rock The Mohawk! The African Oil Palm Tree ( Elaeis guineensis ) is a big tree. They can reach heights of well over 40 feet tall. They like full sun and regular watering. This Palm Tree is native to Africa and grows very fast. 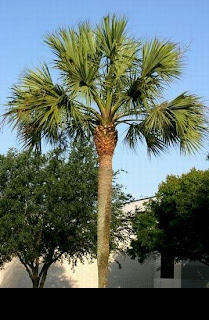 If you are planting one of these Palms in your yard make sure you stay clear of power lines. The fronds of this Palm are covered with very sharp thorns so use caution when pruning. The seeds of the African Oil Palm are the primary source for palm oil that is used in all sorts of fattening foods. These seeds are grown by the tens of thousands in many countries and the oil is exported all around the world. The following pictures are of the African Oil Palm located at Heathcote Botanical Gardens in Fort Pierce Florida. Please enjoy! It appears that Fay has finally left us here in Fort Pierce Florida. It is still very wet, so wet the ground is mushy. We are still getting some pretty good gusts of wind and brief, light showers here and there. The news was saying that here in Fort Pierce Florida, we received the worst of Tropical Storm Fay. While it was bad, it seemed like just another rain storm to me after sticking out Hurricane Frances, Hurricane Jean and Hurricane Wilma. Those were some bad storms, they even made the top ten worst Hurricanes list. I am glad I wasn't gardening back then, I would have lost everything. I had lots of damage in those Hurricanes. I tell you what though, those were some of the best times of my life. It is amazing to see how everyone pulls together in times like that. Everybody helping each other and setting aside their differences for the greater good. I could do a whole post itself about those times. Maybe if I get enough requests for it I will do one. Back to Fay, I can now see the sun peeking out from behind the clouds to help soak up some of this water. It is about time, I haven't seen the sun in days. I can't take to much of that, I think I draw my energy from the sun and without it I am powerless. Lol!! My dad's house in Lakewood Park Florida is surrounded by water. I can't make it over there in my car, but I saw the helicopter cam on the news last night and MAN is it flooded there. They may have had the worst flooding around. It will take a while for them to dry out. Well the sun has just disappeared again and that's my que to go back outside and clean up some more. Have a great day!! Well it is about time, I think Tropical Storm Fay has decided to calm down. It has been raining for a whole day now. My yard is flooded, my whole county is underwater. I tried to go to the store earlier and pulled up to an intersection around the corner from my house and there was water higher than ever blanketing the entire intersection and a full block radius. There was a newer model Mustang car that attempted to cross and he found himself stuck in the middle of the intersection buried with water up to the bottom of his windows. There were also a couple of small trucks stuck out there too. I had to seek out an alternative route. While on my little venture to the store I noticed a few trees that had been blown over by the wind and lots of garbage cans everywhere. It was difficult to travel around in a car, every corner was flooded and there was debris all over. I would say from my experience in the last Hurricanes that Tropical Fay did her thing. I did not expect to see as much damage as I did. Personally I didn't think it was bad at all here in Fort Pierce Florida. We had lots of rain and lots of wind but the wind was not very strong,I just thought that it lasted forever. All in all, we needed the water, it may be enough to lift all the bans. Tropical Storm Fay is dying out but is soon to hit water again and may become a boomerang storm which could mean trouble for the north eastern coastline. No one is sure yet exactly what Fay will do but with any luck everyone is preparing themselves for the storm. I wish everyone good luck. Here are some pictures I took from my yard during Tropical Storm Fay. This one is my little Mangoes hanging on for dear life. The following 2 pictures are of my neighbors Papaya Trees that went down in the winds. This is a picture of my pond area. Here is my baby Pandanas utilis or Screw Pine getting flooded. Here is a picture of my back yard starting to flood. It is about 8 inches deep in this picture. These are my neighbors Palm Trees swaying in the wind. Here is another picture of my back yard starting to flood. Oh boy! I hope you enjoyed reading my post on Tropical Storm Fay. Stay tuned for tomorrows post on the Damage Toll of Tropical Storm Fay in Fort Pierce Florida. In the process of creating Medicinal Monday's I also thought it would be a good idea to add in a Tuesday Tips series. Every Tuesday I will post a new Gardening Tip. For my first Tuesday Tip I have chosen Palm Tree Trimming Techniques. I have seen a lot of Palm Trees that are damaged when they are trimmed because people don't know enough about them, so I thought I might give some basic rules to pruning Palm Trees. The first major rule to pruning Palm Trees is to avoid pruning them at all. Palm Trees are designed to shed their fronds on their own. Just because a Palm frond is turning colors or maybe even browning does not mean that it is done contributing to the tree. The browning of fronds is a process called Trans location of Nutrients meaning that the Palm Tree is recycling the nutrients of the frond back into the heart of the Palm Tree itself. If you remove the fronds during this process then you weaken the Palms defenses against molds and fungi. Allowing the process of self-pruning or self-cleaning is especially important to the species of Palm Trees with a "crown shaft" which is a green shaft located just below the fronds. If it is necessary to prune the Palm Tree then a general rule is applied to Palms that you should not cut fronds that hang below a parallel line to the ground or the 9:00 to 3:00 o'clock rule. This is called a Hurricane Cut or a Candle Cut and is very damaging the the tree. If a Hurricane cut is repeated over and over it will create a condition know as a "pencil top" which is the narrowing of the trunk just below the fronds. The name Hurricane cut comes from the fact that during Hurricane winds, the head of the Palm Tree may snap off where the thinning occurred and become airborne. So there you have it plain and simple, just don't prune your Palm Trees and they will be happy and healthy. And remember the 9:00 o'clock to 3:00 o'clock rule if you absolutely must trim those Palm Trees. Here are some examples of Palm Tree Pruning. I did not take these pictures. Here is a classic example of the Hurricane Cut. This technique should be avoided at all costs. If pruning is necessary, then this is the technique you want to use. Notice how there is a line parallel to the ground. This is called the 9:00 to 3:00 O'clock rule. This blog ( A Yard In Fort Pierce ) is a personal blog written and edited by me ( Lets Plant ). For questions about this blog, please contact LetsPlant (letsplant@gmail.com). The owner of this blog ( A Yard In Fort Pierce) is not compensated to provide his opinion on products, services, websites and various other topics. The views and opinions expressed on this blog are purely the blog owners. If I claim or appear to be an experts on a certain topic or product or service area, I will only endorse products or services that I believe, based on my expertise, are worthy of such endorsement. Any product claim, statistic, quote or other representation about a product or service should be verified with the manufacturer or provider. For a while now I have been thinking about starting a series of posts. I have finally decided what my series will be. Medicinal Monday's, every Monday I will post on a new Medicinal Plant. Everyone should have medicinal plants in their garden for the simple fact that you never know when you might need them. They do not come off of a shelf with an expiration date. You know exactly how fresh they are and where they came from. Best of all they are the cheapest form of medication you can get. For my first Medicinal Monday post I have chosen the well known Aloe Vera Plant( Aloe barbadensis ) . Aloe Vera is also know as Medicinal Aloe and Savila. I am unsure of the origin of Aloe but I do know that it grows here in Florida very well. Aloe is very drought tolerant which makes it ideal for xeriscaping. Aloe grows well in sun to partial shade areas better than most but will pretty much grow anywhere. This species of Aloe does not have the sharp spines like other Aloe Plants. The spines are actually pretty soft. Aloe is edible but doesn't taste very well at all. Aloe Vera is jam packed with lots more pros than cons. Let's weight them out real quick. Sunburn Relief: To do this you carefully remove a piece of Aloe from the plant. Then you skin the piece in your hand. I always leave a piece at the end to hold on to because it is very slippery. Then rub it all over your sunburn and let it dry. Constipation: Aloe prevents the absorption of water in the bowel making it move faster. Low Maintenance: Aloe does not need much care. You can pretty much forget about the plant and it will always be there for you. Cramping: If taken internally, Aloe Vera may cause painful stomach cramps. With that being said I think Aloe Vera is a must have in every garden. I primarily use it for sunburn and minor cuts. Living in Florida I get sunburn very often and I am always cutting myself on something. Here are some pictures of one of my Aloe Vera Plant. I hope you enjoyed this post. See you next Medicinal Monday! Back on 8-1-2008, I placed 20 Dwarf Poinciana ( Caesalpinia pulcherima ) seeds in a pot. I did not do anything special to them. Exactly 7 days later on 8-8-2008 there were many sprouts. I would have to say that the seeds of a Dwarf Poinciana germinate very fast and easy. Dwarf Poinciana trees only grow to heights of about 8 feet tall. If you are planting several of them you should space them about 6 feet apart. These trees are most happy when grown in full sun to partial shade and they have average water needs. If you like Royal Poinciana trees but just don't have the room for them then this is the tree for you. In the following pictures I will walk you through my potting steps. This is my pot full of sprouts. Here is another view of the little guys. This is a fresh baby just waking up. Here is an overhead view of a sprout after I dug it out of the pot. I was very careful not to damage the roots. Here is the little sprout from the side. Here is an up-close view of the mini rootball. And finally here is one of the potted Dwarf Poinciana. I hope you enjoyed this post. Check back to see the growth of these mini trees! Today at Heathcote Botanical Gardens of Fort Pierce Florida, Brandan and I exposed 1 European Fan Palm ( Chamaerops humilis ) and 1 Pygmy Date Palm ( Phoenix roebelenii ) that were knocked over ( probably during a hurricane ). Both of these Palm Trees can grow up to 15 feet and should be placed 8-10 feet apart when planting. These Palms are drought tolerant making them great for xeriscaping. The one thing about these Palm Trees is that they are covered in very sharp spines so I recommend protection and caution when handling or trimming them. When walking by these unique Palms you could barely see their trunks. So, I dug out around the trunks to give the effect that they were hovering across the ground. We also trimmed them up a bit to make them look better. There were Cardboard Palms (Zamia furfuracea ) sprouting up all over the place and Oyster Plants ( Tradescantia spathacea ) were everywhere. There were a few Date Palms( Pheonix reclinata ) that sprouted up, we removed them too. We dug up the Cardboard Palms and potted them and we pulled up the Oyster Plants and through them into the dump pile. We also trimmed some of the other Palm Trees that were in the area and pulled up a bunch of Boston Ferns too. We made a nice path that wasn't there before that allows you to walk behind the scenes. It looks very good if you ask me. The following are pictures of today's adventure. 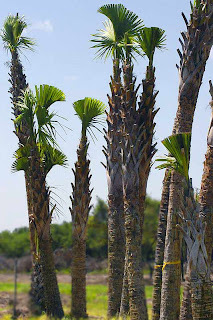 Here are the before pictures of the European Fan Palm Tree. This is after I dug the Palm Tree out to reveal the trunk. These are the before pictures of the second Pygmy Date Palm Tree. You can barely see the trunk. Half of it is under ground completely. These are the after pictures of the Pygmy Date Palm Tree that was completely under ground. Finally this is a picture that captures both of the newly exposed Palm Trees. I hope you enjoyed the pictures, see you again next time! Have a great day!